[116 Pages Report] The digital evidence management market size was valued at USD 3.61 billion in 2017, and is expected to reach USD 7.56 billion by 2023, at a Compound Annual Growth Rate (CAGR) of 11.7% during the forecast period. The base year considered for the study is 2017 and the forecast period is from 2018 to 2023. The objective of the report is to define, describe, and forecast the digital evidence management market size on the basis of components (hardware, software, and services), software (evidence analytics and visualization; evidence collection, storage, and sharing; and evidence security), services (digital investigation and consulting, system integration, education and training, and support and maintenance), deployments (cloud, on-premises, and hybrid), and regions. 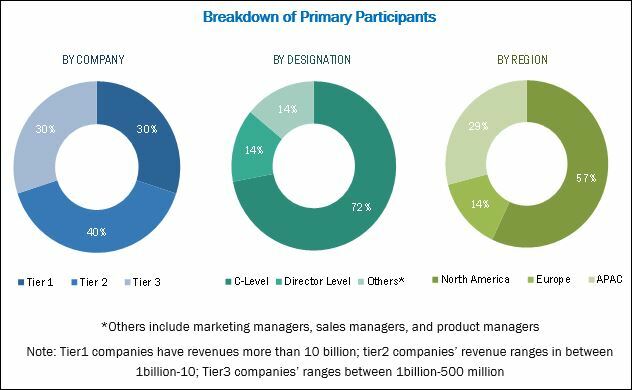 The report provides detailed information about the major factors (drivers, restraints, opportunities, and challenges) influencing the market growth. It attempts to forecast the market size with respect to 5 main regions, namely, North America, Asia Pacific (APAC), Europe, Latin America, and Middle East and Africa (MEA). It strategically profiles the key market players and comprehensively analyzes their core competencies. Moreover, it tracks and analyzes competitive developments such as joint ventures, mergers and acquisitions, and new product developments in the market. The digital evidence management market includes various vendors providing digital evidence management solutions and services to commercial clients across the globe. The vendors include Panasonic (Japan), Motorola (US), NICE (Israel), AcsessData (US), MSAB (Sweden), OpenText (Canada), Digital Detective (UK), Cellebrite (Israel), Paraben (US), QueTel (US), IBM (US), Oracle (US), Hitachi (Japan), Capita (UK), Vidizmo (US), Coban (US),Reveal Media (UK), Porter Lee Corporation (US), SoleraTec (US), VeriPIc (US), FileOnQ (US), Tracker Products (US), Intrensic (US), Foray (US), and WatchGuard (US) These companies have adopted various growth strategies, including new product launches, product enhancements, acquisitions, and collaborations, to enhance their market reach. The study answers several questions for stakeholders, primarily which market segments to focus on in the next 2–5 years to prioritize efforts and investments. MarketsandMarkets forecasts the global digital evidence management market size to grow from USD 4.35 billion in 2018 to USD 7.56 billion by 2023, at a Compound Annual Growth Rate (CAGR) of 11.7% during the forecast period. The major factors that are expected to drive the growth of the market include the increasing rate of digital crimes, rising adoption of digital evidence management solutions among many government and law enforcement agencies, and growing government initiatives for evidence security. In addition to this, rapid investment in the emerging technologies is expected to boost the market growth. The digital evidence management market is segmented on the basis of components (hardware, software [evidence collection, storage, and sharing; evidence analytics and visualization; and evidence security], and services [digital investigation and consulting, system integration, training and education, and support and maintenance]), deployment types, and regions. In the digital evidence management market, the cloud deployment is expected to account for the largest market share. The cloud deployment type plays a vital role in helping investigators enhance their investigation processes, as it reduces the investigation cost and enables access to the critical data from desktops as well as smartphones. The evidence collection, storage, and sharing segment is expected to have the largest market share because the evidence collection, storage, and sharing software helps investigators avoid logging on to different systems, or manually collect data. In addition to this, it also reduces the risk of data redundancy and data loss. The services segment is expected to account for the highest CAGR during the forecast period. Digital evidence management services enable investigators to perform a structured investigation by collaborating digital evidence management software, offering expertise to track the source of a problem, and enhancing the investigation process. 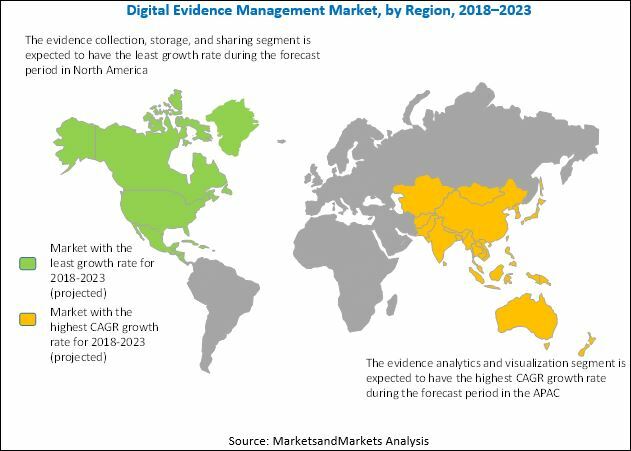 North America is expected to have the largest market share in the global digital evidence management market, owing to the early adoption of technologies and well-established economies in the region. The US is expected to hold the largest market share in North America. Major digital evidence management vendors and law enforcement agencies in the US are willing to use digital evidence management technologies for sharing, storing, and securing the evidence with private companies. Asia Pacific (APAC) is expected to grow at the highest CAGR during the forecast period, due to the fact that emerging APAC countries such as China, Japan, Singapore, and Australia have undertaken several public safety and smart city initiatives. The research study measures and evaluates the major offerings and key strategies of the key market vendors, such as Panasonic (Japan), Motorola (US), NICE (Israel), AcsessData (US), MSAB (Sweden), OpenText (Canada), Digital Detective (UK), Cellebrite (Israel), Paraben (US), QueTel (US), IBM (US), Oracle (US), Hitachi (Japan), Capita (UK), Vidizmo (US), Coban (US),Reveal Media (UK), Porter Lee Corporation (US), SoleraTec (US), VeriPIc (US), FileOnQ (US), Tracker Products (US), Intrensic (US), Foray (US), and WatchGuard (US). These companies have been offering reliable digital evidence management solutions to different government and law enforcement agencies across the globe.